Harvard makes you feel rich. I walked through campus for two years feeling like I’d been cast as Moneybags in a movie about ruling the world and having it all. On Harvard’s campus, tall twisting oak trees blow softly in the wind, casting polka-dot shadows over beautiful red-brick buildings, manicured ivy, and rolling lawns. Students ease open thirty-foot-tall carved wooden doors before stepping into marble-tiled libraries. Between classes, students grab made-to-order sushi from the cafeteria before eating with friends on brown leather couches against walls covered with expensive original art. The students at Harvard Business School feel rich because they either are rich…or they’re about to get rich. The average graduating salary is $120,000! To put that in perspective, the average American makes $24,000. That means a fresh-faced, dewy-eyed twenty-six-year-old with two years of business school under his or her belt makes five times what the average American citizen makes. I know my salary almost tripled after I graduated from Harvard. Yes, Harvard makes you feel rich because it actually makes you rich. Mark and his wife moved to Houston, and he got a job with a high-end consulting company. About a quarter of Harvard Business School grads go work for consulting firms, and the hours are notoriously tough. Unless they land a local assignment, most consultants fly out Monday mornings and fly home Thursday nights, every single week, every single month, forever. Ryan went into private equity in New York. Another quarter of Harvard Business School grads get high-end finance jobs in investment banking, private equity, or hedge funds. They help big companies buy each other, invest in illiquid assets, create complicated investments. But Ryan told me he started work around 10:00 a.m. and worked till 11:00 p.m., seven days a week. Sonia went to work in Silicon Valley at a big tech company. The tech giants hired nearly another quarter of the graduates from our class and had great reputations for gourmet meals, dry-cleaning, and Ping-Pong tables at the office. When I reached out to Sonia a year after graduation she told me she loved her job and was working about eighty hours a week. It seemed crazy to me, but all my friends were working eighty to one hundred hours a week. And a week only has 168 hours in it! I remember thinking, Is everyone nuts? I thought back to Harvard and remembered going out for dinner with a group of McKinsey consultants during a recruiting event. They flew to Boston and wined and dined us at a ritzy joint. We drank expensive wines, ate delicious food, and talked about world issues into the wee hours. My brain was overheating because of the stimulating conversation. These guys were warm, friendly, and killer smart. It was a great night. But the thing I remember most is that when we were finally finishing up around two in the morning, all the McKinsey consultants were…going back to work! They were jumping on conference calls with teams in Shanghai, opening laptops to do emails, or getting together to finalize presentations for the next day. At two in the morning! Consultants and finance folks make up most of Harvard Business School grads and they work approximately eighty to one hundred hours a week. So, are they really making $120,000 a year? Well, the Harvard salary of $120,000 is a fraction, too. Every single job is paid by the hour. Harvard Business School grads make double or triple the money a lot of people make, but they often work double or triple the hours, too. When you work that much, it’s harder to find time to shovel the driveway, play with your kids, or plant your garden, so maybe you hire people on the cheap to do those things for you. You will still have fun! Frankly, the money you’re making can afford luxury vacations and expensive restaurants. You may have even more fun. But there’s less time for fun. Think about whether it’s important to you to feel the pride of a freshly shoveled driveway, the joy of watching your kids discover a new word, or see the tulips you planted in the fall finally bloom in the spring. There’s nothing wrong with either life. But think about the life you want. 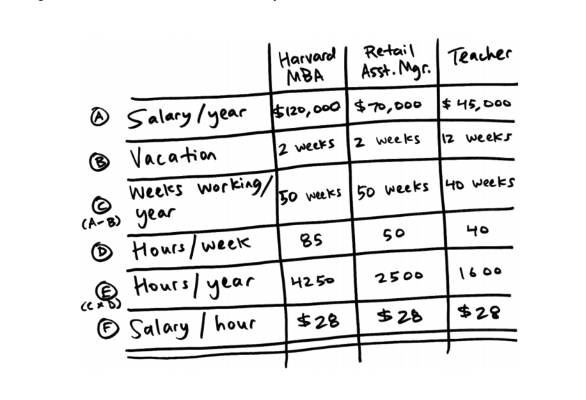 Here’s how much a Harvard MBA makes compared to two very common jobs: an assistant manager at a retail store and an elementary school teacher. They all make $28/hour. Where did I get the numbers from? Well, teachers are scheduled for seven-hour school days (usually 8:30 a.m. to 3:30 p.m.) with typically an hour off for lunch. Let’s round that up to thirty working hours a week. But we all know how hard teachers work. We know it’s way more than that! My dad is a teacher, my wife Leslie is a teacher, and they bring work home. The average teacher does an hour or two of work every single night! Marking, prepping, coaching a team. So I added ten hours a week for that. Retail store assistant managers are typically scheduled for forty-hour workweeks, but it’s a tough job. They end up working before or after shifts sometimes. There are questions, issues pop up, people call them at home. So I added ten hours a week for that. And the eighty-five hours for Harvard MBAs? It’s a ballpark average figure based on my data, research, and personal experience. Working on consulting gigs in a Chicago hotel room or slaving away on an investment banking deal doesn’t exactly give you free evenings or weekends. Although these numbers are generally accurate, of course there are exceptions—maybe you’re a teacher who works eighty-five hours a week or a Harvard MBA who works forty. But stick with me here, because this secret still has meaning for you. They all make $28/hour! So how do you make more money than a Harvard MBA? Work more hours and make way more per year. Work way less hours and make less per year. This works because when you overvalue your time you make more money by working less hours and earning more dollars per hour. But wait: Am I telling you to work less? Absolutely not! My point isn’t that you should suddenly dial down your interests, passion, or career. My point is to calculate how much you make per hour and know this number. Remember this number. Have this number in your head. I have friends who work around the clock as downtown lawyers and they joke, “When I do the math I actually make less than minimum wage.” They’re right! And, frankly, I don’t understand them. Do not make less than minimum wage. The way to make more money than a Harvard MBA isn’t to get your annual salary over $120,000 or $150,000 or $500,000. It’s to measure how much you make per hour and overvalue you so you’re spending time working only on things you enjoy. The average life expectancy in our world today is seventy years, and we sleep for a third of that. That means you have less than 17,000 days in your life total. 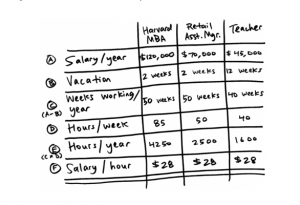 Understand how much a Harvard MBA really makes and overvalue you so every single hour of your working life is spent doing something you love. Adapted from the book The Happiness Equation by Neil Pasricha.